Super fun inspiration site on Splitcoast Stampers today. I loved the inspiration it reminded me of the stitched patches on this darling Green Duck embellishment. These darling images are from Green Duck Sales. 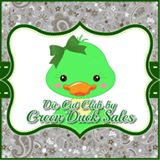 They have a great fan club program that you can check out: Green Duck Sales or you can follow them at Green Duck Facebook. Great card Lisa. Love the blue background with the scarecrow's blue jean overalls. Thanks Ann. These papers looked great with the fun colors in this scarecrow.